The report, based on data from the credit reporting firm TransUnion, provides insight into how many Americans continue to experience financial stress even though the recession is technically over. The Urban Institute’s analysis doesn’t focus on mortgage debt, since delinquent home loans generally go into foreclosure and rarely to collections. 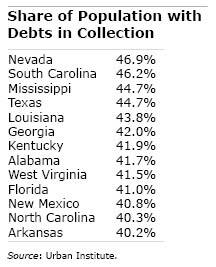 Yet many of the Southern states were also hit harder by the housing market collapse than the nation as a whole. 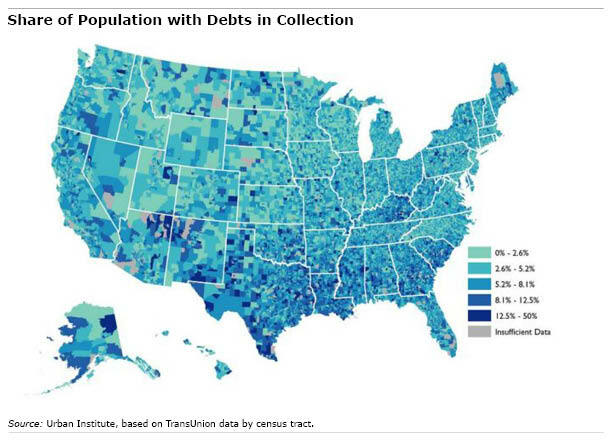 Cities found to have inordinately high shares of their populations with debts in collection include Las Vegas, El Paso, Memphis, Baton Rouge, Orlando, the District of Columbia, and Columbia, South Carolina. The gamut of bills may wind up with debt collectors, the final resort for bills overdue and unlikely to be paid. People may not be able to pay a medical or utility bill, or even a parking ticket, or they may miss a car payment, child support, or an installment loan or credit card payment. But once this occurs, the bad debt can remain on one’s credit history for seven years. The TransUnion data were collected last September for 7 million people. The Urban Institute said that collection patterns vary widely by region. But it called “alarming” the fact that 77 million people with a credit file – one in three people nationwide – is dealing with a collection agency. That figure is roughly in line with the estimate that the Federal Reserve reported a decade ago, prior to the Great Recession.